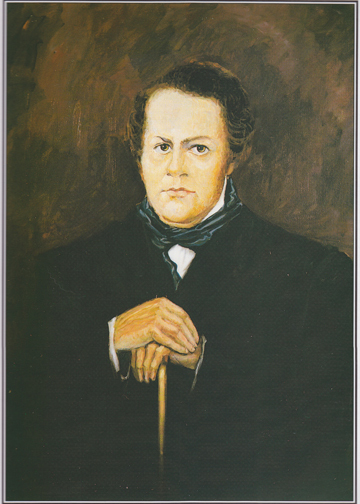 J. P. Miller was born in Randolph, Vermont on February 24, 1796, the son of Herman and Deimia (Walbridge) Miller. After the death of his father in 1799, Miller, was taken in, first by an uncle, who died in 1805, and then by John Granger of Randolph. Upon the completion of his common school education in 1813, Miller went to Woodstock, Vermont, to become a tanner. An ailment forced Miller to return to Randolph and four years later he enlisted in the army and served for two years. Illness once again compelled his return to Randolph. In the fall of 1821, he enrolled at Dartmouth College but soon transferred to the University of Vermont. Unfortunately, a fire destroying the buildings of the college cut his studies short. Deciding not to complete his degree elsewhere, he embraced the contemplation of offering his support to the Greek cause. A move, likely influenced by his study of the classics, and his love for adventure and military life. In 1824, he procured a letter from Governor Van Ness introducing him to the Greek Association in Boston, in turn, undertaking the cost of sending him to the town of Missolonghi in western Greece. Miller was also assigned the duty of delivering letters to the local Government from the committees in the United States. On November 26, 1824, he arrived in Missolonghi, reporting to Dr. Mayer and Gen. George Jarvis. During the next two years, he rose to the rank of Colonel in the Greek military and in Jarvis’s regiment. Miller quickly mastered the Greek language and adopted the Greek dress. His altruistic disposition would not permit him to seek payment for his services, given the fact that he was destitute. His military antics earned him the nickname of “The American Daredevil.” In December 1824, he participated in the proceedings of the western Greek convention in Anatolico, Atolia. He stayed in Missolonghi until January 1825 and took part in the valiant but futile Nafpaktos operation with General Jarvis. In April 1825, he joined in the campaign against Pasha Ibrahim in the Peloponnese, and served under Prince Alexander Mavrokordatos. At the outset of the siege, Miller was stationed in Missolonghi but prevailing circumstances necessitated Miller’s departure to Nafplion in June 1825. In Nafplion, Miller along with Demetrios, Ypsilantis, Makriyannis and other Philhellenes participated in the battle at Myloi. After a brief illness in August 1825, he departed for Gramvousa, Crete, with Samuel Gridley Howe. He stayed in Gramvousa for two months, helping take care of the wounded. Upon his return from Crete in November 1825, he visited Athens and Nafplion until June 1826. Leaving Greece to return to America to relay information to the various American committees, Miller came across on of the many orphans left by the battles of the war in Livadia, Greece, a young three year old boy who he brought with him to the United States. He later adopted the boy, Lucas Miltiades Miller. Lucas Miller studied law and was admitted to the bar in 1845. He served as Colonel of Militia in the American-Mexican War. In 1853, at the age of 29, he was elected to the Wisconsin State Congress. In 1891 he was elected as a Democrat to the Fifty-second Congress, the first Greek-American to serve in the U.S. Congress. Miller was responsible for establishing the towns of Athena, Arcadia, and Marathon in the state of Wisconsin. Miller died in December 1902 and is buried in Riverside Cemetery, Oshkosh, Winnebago County, Wisconsin. To read and learn more about Jonathan Peckam Miller please contact us.